Latourell Creek merges with Young Creek (Shepperd's Dell) and flows westward across the flats of Rooster Rock State Park, forming Mirror Lake. Mirror Lake then flows past the base of Crown Point where it merges with the Columbia at Columbia River Mile (RM) 129, at the Rooster Rock boat ramp. "Mirror Lake" is depicted on topographic maps, however the U.S. Geologic Survey's Geographic Names database (2014) has no listing. Mirror Lake can be nicely seen from the eastbound lanes of Interstate 84. 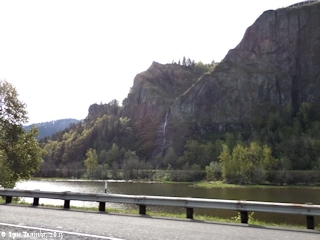 Better views can be had from the I-84 exit ramp to Rooster Rock State Park.